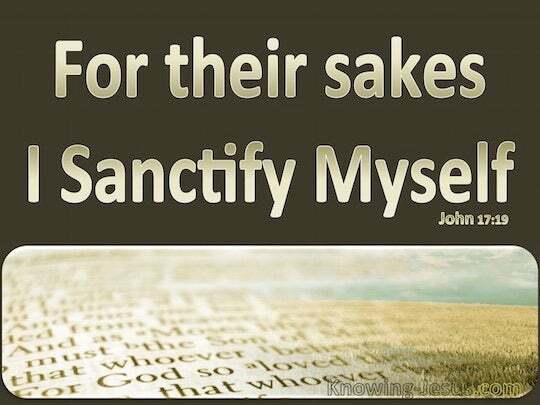 ﻿ John 17:19 "For their sakes I sanctify Myself, that they themselves also may be sanctified in truth. I sanctify Myself for them, so they also may be sanctified by the truth. It is for their sakes that I sanctify myself, so that they, too, may be sanctified by the truth. 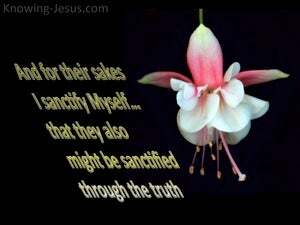 And for their sakes I sanctify myself, so that they may also themselves be sanctified in truth. And for their sakes I dedicate myself [to you] so that they themselves also may be truly dedicated [to you]. and for them I sanctify myself, that they also may be sanctified through the truth. And for them I make myself holy, so that they may be made truly holy. And for their sakes I sanctify myself, that they also may be sanctified in truth. and for their sakes I consecrate myself, that they also might be consecrated by the truth. and I sanctify myself for them, that they also may be sanctified by truth. and I sanctify myself in their behalf, in order that they may also be sanctified through the truth. And it is for their sake that I consecrate myself, that they also may be consecrated by truth. And for their sakes I sanctify myself, that they also may be sanctified thro' the truth. And for their sakes I sanctify myself, that they also might be sanctified in the truth. 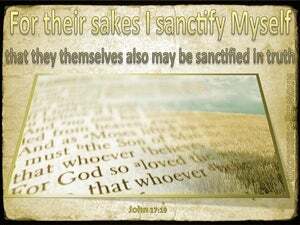 And for them I sanctify myself, so that [they] themselves also may be sanctified in the truth. And I sanctify Myself for their sakes, so that they also might be sanctified in truth. And for their sakes sanctify I myself, that they also might be sanctified through the truth. and for their sake I consecrate myself that they may be consecrated by the truth. And for their sakes I dedicate myself, that they also may be thoroughly dedicated in the truth. And I set myself apart on their behalf, so that they too may be truly set apart. And in their behalf I sanctify myself, that they also may be sanctified in the truth. And, on their behalf, I, hallow myself, that, they also, may have become hallowed in truth. And for them I devote myself, that they also might be sanctified by the truth. And it is for their sakes that I am consecrating myself, so that they also may be truly consecrated. And for their sakes I sanctify myself, that they also may be sanctified through the truth. and on their behalf I consecrate myself, in order that they may become perfectly consecrated in truth. And so for their sake I am consecrating myself, that they too may be consecrated by truth. and in their behalf I sanctify Myself, that they also may be sanctified in truth. 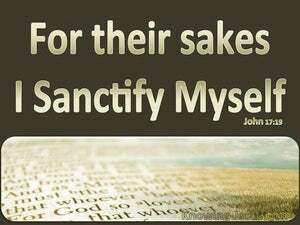 and for them do I sanctify myself, that they also themselves may be sanctified in truth. For Zion's sake I will not keep silent, And for Jerusalem's sake I will not keep quiet, Until her righteousness goes forth like brightness, And her salvation like a torch that is burning. For all things are for your sakes, so that the grace which is spreading to more and more people may cause the giving of thanks to abound to the glory of God.